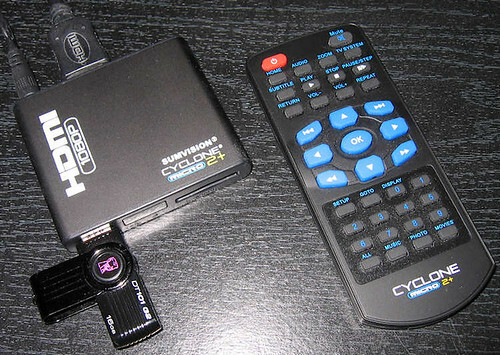 www.derbyphotos.co.uk - The blog by Andy Savage: My review of the SumVision Cyclone Micro 2+ HD Media Player. It plays anything and everything for less than £30 ! 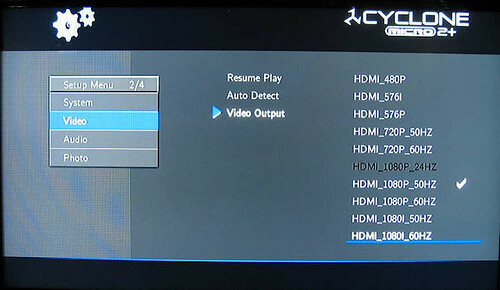 My review of the SumVision Cyclone Micro 2+ HD Media Player. It plays anything and everything for less than £30 ! Cyclone Micro 2+ Full HD HDMI 1080p MultiMedia Player Currently this is only £25.45 from Amazon ! Photograph of my HDMI Media Player and remote control. At the back of the device is the power lead and a HDMI cable to my TV. In the front is my Kingston 16Gb Flash Drive. I can highly recommend the Kingston DataTraveler 101 Gen 2 16GB USB Drive as it only costs £8.16 from Amazon. 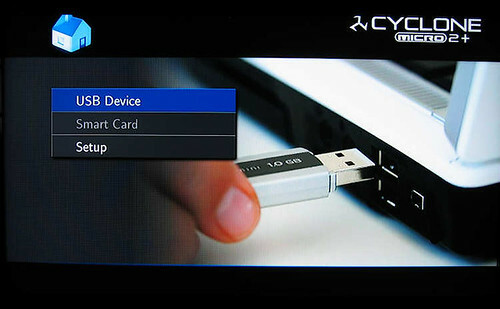 This is a very small complete media player that connects to your TV via the HDMI connection or the AV connector. 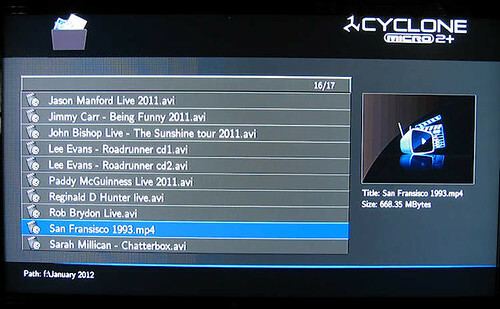 You copy the files you want to view (videos, music, photographs) onto a USB memory stick and you can then view them on your TV. It comes with a nice little remote control. It will play just about anything. Its perfect if you have lots of AVI or MP4 files that are in DivX format as you can simply copy them onto the USB Flash stick and it will play them without having to convert them. I have been using the previous model (Micro 2) for a couple of years and its always worked well but did not support .mp4 video files, this new model DOES play mp4 files ! also the previous model did not handle corrupted files, it would suddenly stop and move onto the next video, this new model seems to cope ok. I have tried it with the very same problem video file and it played it perfectly. 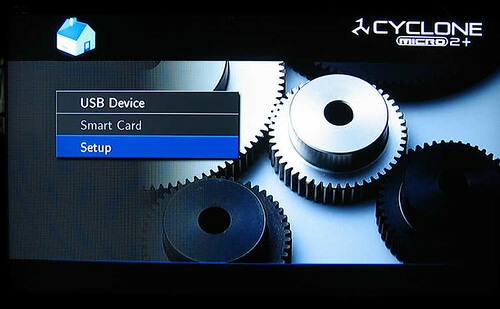 Screen shots of the menu system of the "SumVision Cyclone Micro 2+ HD Media Player"
This is the first screen that you see when you switch the media player on with the remote control. In the Setup menu you can select what HDMI mode you want to use. To play a video file simply press the OK or play button on the remote control. You have all the usual controls that you would expect on a playing device. Also if you press the Display button while playing a video then it shows you details such as current position, time remaining, Video Resolution, Audio Codec type. If you buy the model I have reviewed here then you may also be interested in my post on how to download 1080p videos from YouTube for playing on this media player. The player does NOT come with the HDMI lead but DOES come with the A/V lead. HDMI leads come in different lengths and quality. Its worth paying a bit more for a gold one. It supports these video formats (codecs) : MKV, VOB, AVI, MPG, MPEG, MP4, M4V, MOV, HDMOV, RM, RMVB, AVC, PMP, .264, H.263, MKV, RM/RMVB (8/9/10), MPEG 1/2/4 and Xvid. And these audio formats : MP3, WMA, OGG, FLAC, APE, AAC, AC3, RMVB. I have been using this media player for a few months now and can't fault it. Very reliable and plays anything you throw at it. Get one now ! P.S. The previous model of media player allowed you to delete videos with the remote control but this one does not seem to allow that, do you know if you can? these look cool and i did not know they were so cheap so going to order one now. I can confirm it plays everything, I use Pirate Bay to get my films and EZTV for my does of CSI thats not out in uk yet and it plays all the mkv and mp4 verisns ive downloaded from there. Real shame pirate bay is going to be blocked by TalkTalk may have to move to BT to get my films. I have an earlier model too – it is rendered useless if the battery runs out in the remote – no onboard buttons. Is this one the same? Yes Rob, Without the remote you are stuffed. Adding buttons to the design would increase the size of the unit and cost. The remote on this model is a lot better than the crappy thing on the micro2 model. "Ruined a holiday for us", thats quite a statement. lol ! Amazing what you can get for your money these days. I did not know you could do that, I've always had to burn my DivX videos onto a DVD-R so I can play them in my DivX DVD player but thats a bit of a pain. This nifty little device is what I need. I've gone for the Sumvision Cyclone Micro 3 model as it has internal storage on it and a better remote. By pure coincidence, I also live in Derbyshire. Cromford to be exact, and this little cyclone player is the ONLY bit of media kit I own apart from the TV to view the videos put out by it. I've used this tiny gadget for over 12 months of viewing pleasure. Nobody should be without one, but beware, it will replace ALL your kit. I have a Cyclone Micro 2+ and it works perfect (in the sense that it plays whatever you throw at it). But: after about 1,5 hours continuously playing, it stops playing sound. The picture continues........(but as a silent movie). So I have to switch it off and wait a while before I can resume watching. Any idea what that may cause? Sounds like its overheating to me, are you using the original PSU? are you operating it in open air or on top of other electrical items that are heating it up or is it sandwiched between other kit which is making it heat up? Sounds like its heat related!